Some mainstream scientists may have people believe that humans evolved from lower life forms over the last 10,000 years or so, however, archaeologists have already discovered many artifacts of various ancient human civilizations that are millions of years old according to scientific carbon isotope dating. And guess what, these artifacts provide evidence that these ancient humans were even more advanced than we are today. In 1972 at a uranium mine in the Gabon Republic of Africa, an open-air large-scale nuclear reactor with a highly sophisticated layout was discovered and calculated to have been built 1.8 BILLION years go and active for 500,000 years. A French manufacturer importing uranium ore from here found it had strangely already been used, so they send scientists to examine the site. They concluded the uranium here was more than twice as powerful as normal uranium and practically impossible to have naturally occurred. Dr. Glenn T. Seaborg was head of the United States Atomic Energy Commission and Nobel Prize winner for synthesizing heavy elements who believes this highly concentrated uranium site was not a natural phenomenon but in fact a man-made nuclear reactor. This reactor is more advanced than anything we can build today, being miles long yet remarkably only heating it’s surroundings within 130 feet while containing all radioactive waste in the nearby earth. Reactor engineering specialists believe this Oklo site’s uranium could not contain such high concentrations of U-235 for nuclear reactions to naturally occur. Plus, extremely pure water is required for uranium to “burn” in a reaction, which does not exist naturally anywhere in the world. In the National University of Peru, there is a 65 MILLION year old engraving on a rock with a person wearing modern clothes and observing the stars with a telescope. It’s was previously believed that the European astronomer, Galileo Galilei invented the telescope in 1609 but this finding proves otherwise. There are 10,000 other stones in the Cabrera Museum in Ica, Peru showing more ancient humans with clothes, shoes, and headdresses. There are also medical scenes of blood transfusions, organ transplants, and cesarean sections — even riding dinosaurs! 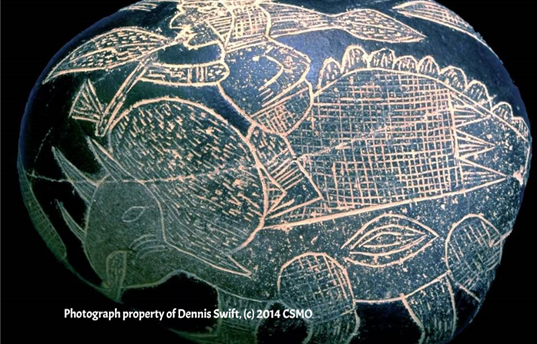 Dr. Dennis Swift, author of “Secrets of the Ica Stones and Nazca Lines” and archaeologist from the University of New Mexico, recorded evidence that these stones are from Pre-Columbian times. He has been around the world and collected similar artifacts depicting the lives of ancient peoples proving than mankind is much older than many know. In 1937 Léon Péricard found 14,000-year-old paintings in the La Marche caves of western France of people with tailored clothing, groomed beards, short hair, and riding horses. This proves that ancient humans were much more sophisticated than the infamous “caveman” concept with ragged animal skins and messy long hair. In 2002, Dr. Michael Rappenglueck reevaluated Péricard’s findings and believes they are genuine and noted that many floor paintings and etchings, which may contain even more valuable relics, were damaged during the earlier excavations. Rappenglueck also believes that this, and other such discoveries, are ignored or even kept hidden by modern science. For example, some pieces from La Marche cave are displayed in Paris’ Museum of Man except for the best ones that show the sophisticated culture of these ancient people. Thankfully, now we can share information so easily and quickly. In this information age, stubborn incorrect notions are being rectified by the newly revealed truths.